Editor’s note: Global Sisters Report recently held a discussion with Sr. Carmen Sammut, president of the International Union of Superiors General and superior general of the Missionary Sisters of Africa; Sr. Pat Murray, executive director of UISG and member of the Institute of the Blessed Virgin Mary; Sr. Sharlet Wagner, president of the Leadership Conference of Women Religious and a Sister of the Holy Cross; and Sr. Carol Zinn, executive director of LCWR and a Sister of St. Joseph of Philadelphia. This is an edited transcript of that discussion. 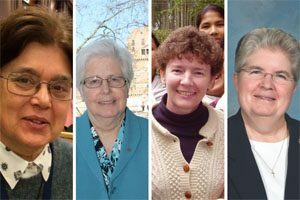 GSR: In the last few months, when the issue of sexual abuse of sisters by clergy came up, both LCWR and UISG made statements. Are there any plans in either organization to follow up on this issue? Have you been asked, either one of these organizations, by the Vatican or bishops for further input about what’s happening with sisters in your realm of the world? Wagner: For LCWR, I would say we’ve not been asked for further input apart from the bishops’ invitation to Sr. Teresa Maya to address them at their November meeting of the USCCB. We have been taking opportunities to speak. Where they arise, we put out a few statements. We have done interviews with some national and international media and have brought up issues with dicasteries as we visit. Murray: We try to create the conditions so that if people need to speak, they will be helped to speak. This is a huge area because it’s a huge cultural dimension. It’s a bigger question than the question within the church — the whole question of the status of women within cultures. It requires a huge educational and cultural shift in every part of the world. Zinn: The other piece from LCWR’s perspective and, I think, UISG sisters’, too, is that one of the things that we’re trying to be faithful to is to keep the survivors in the front of the story that while a cover-up is certainly a reality, the bigger reality, really, is the pain and suffering of those who have suffered the abuse. So when you ask what are we doing and what do we hope to do in terms of Sister Veronica [Openibo]’s piece about breaking a culture of silence and secrecy, LCWR’s focus has been from the beginning and continues to be first and foremost on the survivors — not victims, on the survivors. Then secondly, on the abuse of power.